Daily Illuminator: Preorder Triplanetary Today! June 11, 2018: Preorder Triplanetary Today! As the Kickstarter campaign for Triplanetary comes to a close, with rewards shipping out to project backers over the next week or two, we've opened preorders for the game on Warehouse 23. This 1973 sci-fi classic, last published in the early '80s, is one of many retro-style games we've got in the works these days, and we continue to learn lessons from Kickstarter to make each project better than the last. Just wait until you see what we've got planned for next month's The Fantasy Trip campaign on Kickstarter! 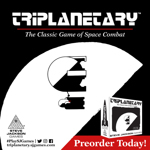 We kept the total number of copies of Triplanetary to a minimum, so please ask your favorite local store to preorder the game for you – or preorder today at Warehouse 23 – so you don't miss out. Seriously, I don't know of a time when we had so few copies of a new title going into distribution. Thank you to everyone who supported the game on Kickstarter to make the updated edition a reality, and extra special thanks to all of you who have been waiting for this project ever since Steve first announced the new edition of Triplanetary back in 1991.